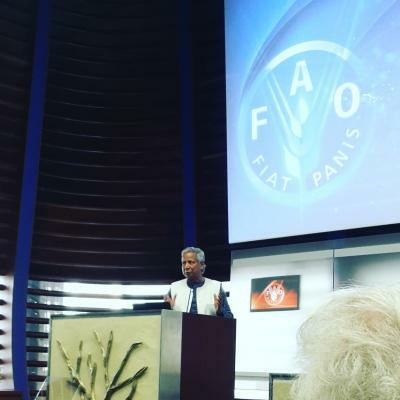 ROME - The Food and Agriculture Organization (FAO) hosted a one-day conference on Social Business, a view of non profit and for profit walking side-by-side, headlined by Bengalese economist Professor Muhammad Yunus, winner of the 2006 Nobel Prize for Peace and Founder of the Grameen Bank. The bank is renowned for its innovative way of working with micro-credits to support low-income citizens with their education, with opening new start ups, or even to help support their health costs. “Our bank works away from the traditional view of financial banking: we work on trust, knowledge, and community feeling - not loans” highlights Prof. Yunus. The key concept of the conference was that making profit whilst helping others is possible. “We are not doing charity work, yet we can feel good for helping others, and keeping up our enterprise. One has to simply put on their social business glasses and look at a different way of doing business” emphasized the Bengalese economist. Among all the important panelists that ranged from politicians such as Minister of the Environment Gian Luca Galletti, to CEOs of important companies who decided to incorporate a new social business, like McCain, the final panel included bank and insurance companies such as UNIPOL CEO Perluigi Stefanini. The main points debated by Prof. Yunus, that business objectives are to overcome poverty with attention to nutritious food, financial and economic sustainability, were supported by the panelists. With the success of these points investors would get back their investment amount and the remaining would stay in the investing company for future development, it must be environmentally conscious, and the workforce would get better wages with better working conditions. “No peace without food security, no food security without peace” emphasized Prof. Yunus several times. The lecture was organized in collaboration with Social Business Italia, Arco, The Budapest Centre, Confederazione Italiana Agricoltori, Human Foundation, Grameen Italia Foundation, and Win Win. The conference was followed in the afternoon with workshops organized by Social Business Italia and Arco with interactive session on which elements to consider when trying to build a social business.